The Pew Research Center’s latest annual State of the News Media report underlines how successful technology giants continue to be at creaming off digital ad profits, even as traditional news media faces ever intensifying pressure to find a way to sustainably fund journalism. The ongoing irony being that the journalism ‘product’ is routinely passed around as ‘content’ keeping users engaged on the same tech platforms that are the primary beneficiaries of growth in digital advertising. 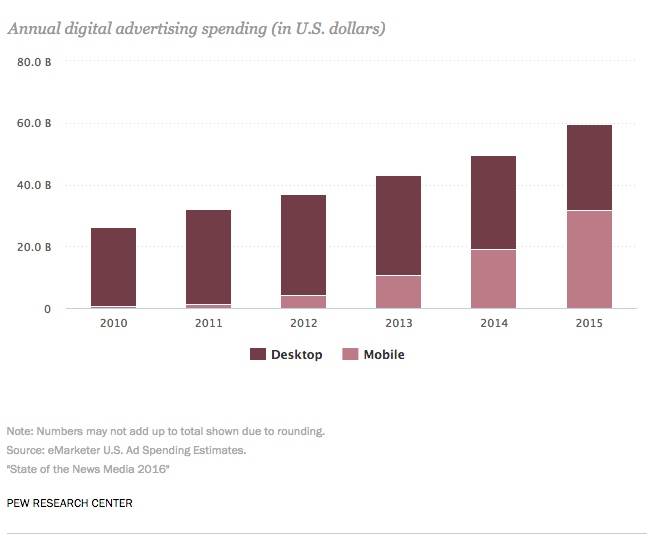 Pew’s 2016 report notes that total US digital ad spending, covering any digital ads on social media, search engines, or any other kind of website, grew another 20 per cent in 2015, to almost $60 billion — a higher growth rate than in the two preceding years. And this at a time when in the newspaper industry it’s been a story of shrinking budgets and substantial job losses. 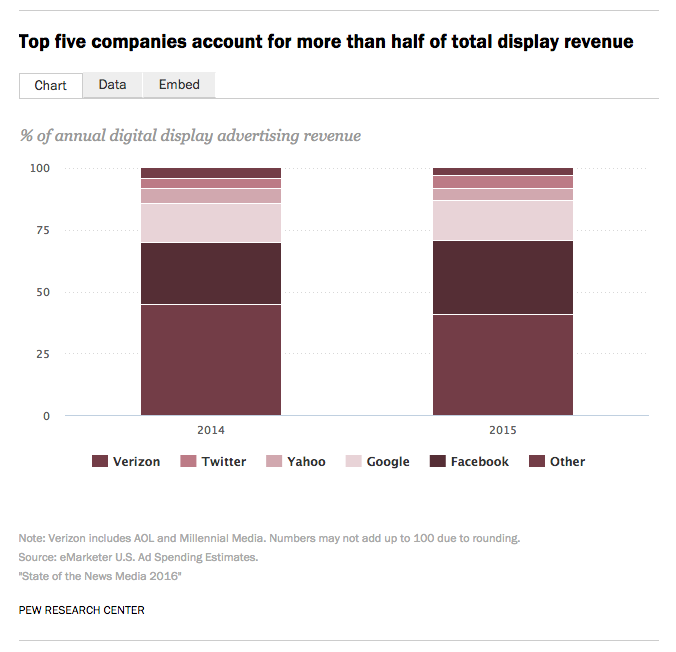 “[C]ompared with a year ago, even more of the digital ad revenue pie – 65% – is swallowed up by just five tech companies. None of these are journalism organizations, though several – including Facebook, Google, Yahoo and Twitter – integrate news into their offerings,” notes Pew. Pew found that nearly four-in-ten U.S. adults (38%) said they often get news from digital sources, including news websites or apps (28%) and social networking sites (18%). That still trails the 57% who often get news from a television source but outpaces both radio (25%) and print newspapers (20%). Instead of news media benefiting from growth in digital ad spending, Pew notes how tech companies such as Facebook and Apple have succeeded in supplanting the choices and aims of news outlets with “their own choices and goals” as their platforms have become the dominant sources for content distribution, taking over the role that used to belong to newspapers. And while the concentration of digital ad spending in the hands of a handful of tech giants began on desktop platforms, Pew says the data shows it “quickly took root in the rapidly growing mobile realm as well” — which the report also notes accounted for slightly more than half of all digital ad spending last year. Meanwhile, audiences for news are increasingly turning to mobile devices to find and consume it. A new analysis by Pew of digital traffic to 110 print, broadcast and digital news outlets found that the vast majority (99) attracted more visitors from mobile devices than from desktops, up from 71 during the same time period in 2014. The mobile preference was particularly striking among print outlets studied: among the 50 highest circulating daily newspapers Pew looked at it found the number whose digital traffic was mobile-majority increased by more than half in 2015 to 44. While for the 12 news magazines tracked the number whose traffic was mobile-majority more than doubled from four to nine in 2015. Pew also looked at the distribution strategies of 40 digital-native news media publishers, finding that all have an a presence on the more established social networking sites: Facebook, Twitter and YouTube. Although only half are on Snapchat (the newest platform of the ones it studied and still — as it puts it — a “breeding ground for experimentation” by news publishers). It also notes US news media engaging in some digital experiments in original reporting and storytelling last year — such as the NYT trying its hand at virtual reality journalism to let consumers “experience” the news, or the Washington Post and Quartz building chatbots for content distribution — but even here, at the experimental edge of news as a ‘product’, Pew argues that “the lines of dependencies with technology companies are deep”. And with so much power to influence public opinion concentrated in the hands of a tiny handful of tech giants which dominant content distribution, questions naturally arise about how those companies wield that power. Such as, for example, the concerns raised last month about the underlying workings of Facebook’s Trending Topics section. “As these lines continue to solidify it will be important to keep in mind that the result is about far more than who captures the upper hand or the revenue base. It is determining how and with what kinds of storytelling Americans learn about the issues and events facing society and the world,” Pew adds. You can read Pew’s full State of the News Media report here.